The First Responders are now active and are providing emergency help to residents of Clare and the surrounding areas. A rota has been established whereby First Responder volunteers are on standby to answer requests for assistance from the Ambulance Service. The emergency equipment (including defibrillators) is allocated to whichever of the First Responders are on standby. The group have received a number of requests from the emergency service and have been able to respond, prior to the arrival of the ambulance, on a number of occasions. We have recently been joined by some additional volunteers, but more are needed, to increase both the areas around Clare where coverage can be provided, and also to extend the time periods when the First Responder coverage can be made a vailable. 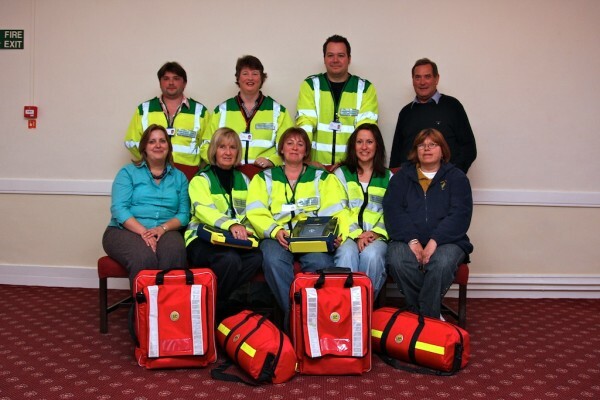 After first aid training by the East Anglia Ambulance Trust in the use of the defibrillators and other equipment, each member contributes as little or as much time as they are able, and receives full support from the group. The First Responders are not called out by the ambulance service to traumatic incidents (such as car accidents), incidents involving children nor situations where the Ambulance Service believe there would be a danger to the First Responders. Leaflets describing the work of the First Responders are available in the Clare Pharmacy. If you would like to consider joining our Group or you are interested to learn more about the Clare First Responders, please contact us. You are also welcome to drop in on one of our meetings. The meetings are held in general on the second Thursday of each month.